Shopify Product FAQ : Shopify Product FAQ is a wonderful application which enable you to add FAQ for any product , you can add dynamic different FAQ for each product . 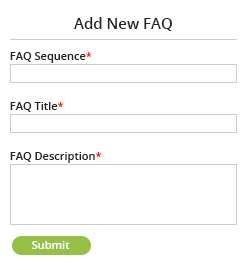 FAQ will be display on Product description page in jquery accordion style . you can customize color , width of FAQ block by backend. Shopify Product FAQ - Shopify Product FAQ is a wonderful application which enable you to add FAQ for any product , you can add dynamic different FAQ for each product . FAQ will be display on Product description page in jquery accordion style . you can customize color , width of FAQ block by backend. With the help of this module, Admins can add related FAQ (Frequently Asked Questions) with the products. FAQ is a set of tentative question which may arise in the mind of buyers about the product. Hence FAQ increases the sales as now buyers have most of their doubts sorted in the form of FAQ pre & post purchase of the product. FAQ is also an set of information in the form of Question and answers ,which gives the detailed description regarding the product. FAQ gets displayed on the product description page. Admin can add FAQ with each products. Admin can edit or delete the FAQ as per his requirement. Shopify Product FAQ is having Ajax Accordion user interface . Admin can customize color , width of FAQ block from backend. Once the marketplace FAQ module has been installed, the Admin needs to configure it to set the appearance of the FAQ on the product detail page. 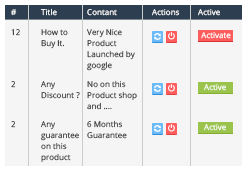 Admin can add New FAQ's for a particular product even if few FAQ were already added to that product in the past. Admin can also delete the added FAQ. Did you buy Shopify Product FAQ ? Great App With Good Support. Good support and great app. We've been busy, so we have not really had the time to get this across all of our pages. However, it is a very easy app to use - and the support is great. We only needed to ask one question about how to put links into the FAQs and they answered right away.